Holly Goes Lightly: Hot Air Ballooning! Another honeymoon adventure that John and I did was going on a hot air balloon ride. If I had a bucket list, riding in a hot air would be on it. It's out of my comfort zone for sure, and I'm really happy we did it. We had company :) There's two major hot air balloon companies in Santa Rosa. I'm happy to report that we got the longer ride! Our reflection! I had to have John take this picture- I was too nervous to look straight down! They typically include a champagne brunch at the end of the flight. 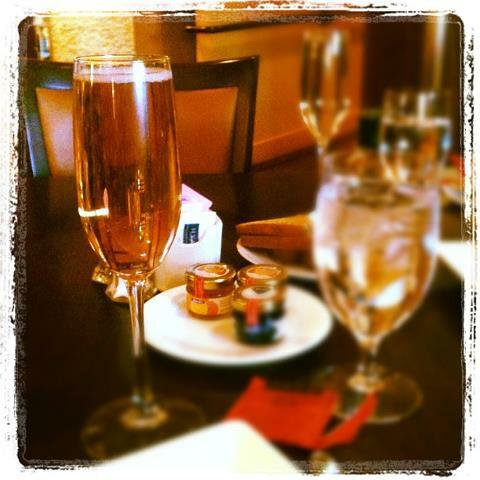 Sadly, ours had to be canceled, but John and I just added champagne to our hotel breakfast! Can you imagine what it would be like in autumn? Gorgeous! This is so amazing, I've always wanted to take a hot balloon ride. Really cool shot of the reflection...I don't blame you for being a bit nervous to take the picture. I love the rush of heights but every now and then they freak me out. Holly, this looks so amazing! You must have had a wonderful time!